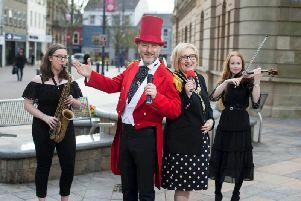 Fountain community worker Jeanette Warke will be among the guest speakers at the launch of a new film charting the ongoing evolution of murals and street art in Londonderry and beyond. ‘Together in Pieces’ is a gripping 25 minute documentary on the changing landscape of Northern Ireland. The world famous murals and political slogans that have taunted its communities for over 40 years are being slowly transformed by a graffiti revolution. This special screening at Centre for Contemporary Art (CCA) for Culture Night features an introduction by the film makers Eileen Walsh and David Dryden, followed by a Q&A and panel discussion. Guest speakers include: Jim Curran: Lecturer in Media Production at the University of Ulster School of Film, Media & Journalism and Founding Member of the Nerve Centre. Jeanette Warke (Cathedral Youth Club, based in the Fountain Estate). Colm Villa: Director, Screenwriter and Film Maker: Following the release of his controversial first feature Open Asylum, a political thriller set in Northern Ireland in the 1970s, Colm has gone on to direct and write various drama series and programmes for the BBC and ITV (Bergerac, The Bill, Medics). Villa’s first major release was Sunset Heights, a futuristic thriller set in Londonderry, where he is now based.